Quality, sensible, healthy and scientifically formulated horse feeds developed with the Midwest and Northeast horse in mind. 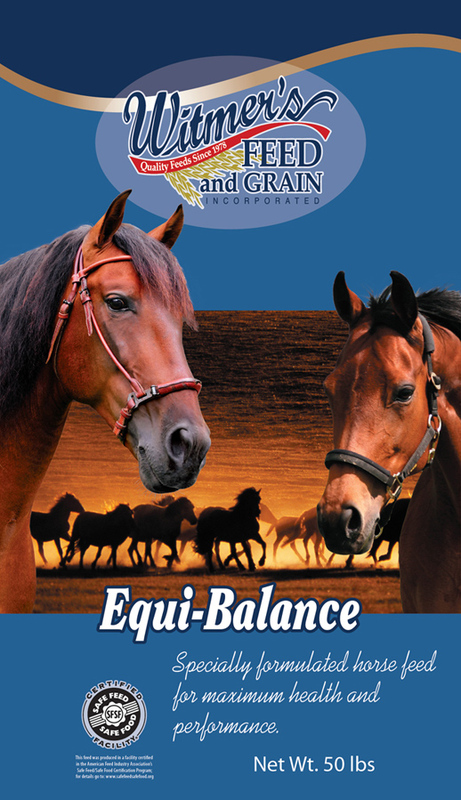 Every Equi-Balance product is formulated with highly digestible ingredients to meet protein and energy needs and provides all the vitamins, trace minerals, and omega fatty acids your horse requires. Each feed also contains a unique blend of probiotics to optimize gut health by improving both fiber digestion and controlling hind gut pH, reducing the risk of colic and ulcers. With a product solution for most situations, you can rest assured that as your horse’s needs change your feed of choice does not have to. 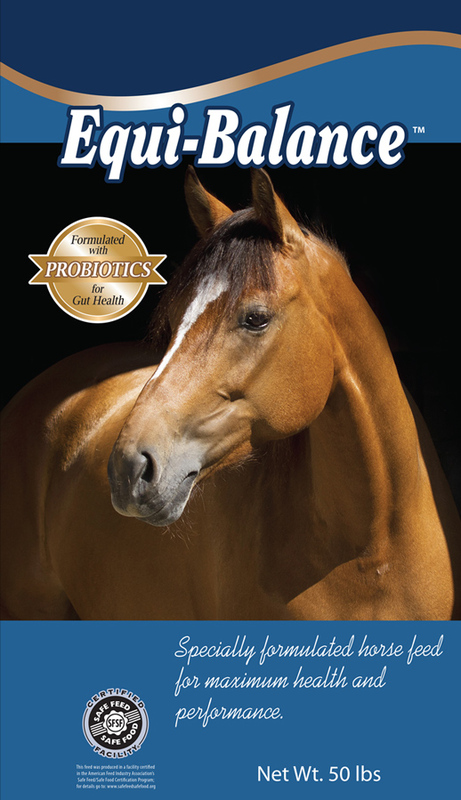 All Equi-Balance feeds are formulated with a probiotic to promote hind gut health. A 14% protein, 8% fat, 19% fiber pelleted horse feed formulated without corn or molasses for a low NSC level. Great for the hyper-active horse or a horse with metabolic problems and can be fed to growing or mature horses. Feed at a rate of 5 to 10 pounds per day, depending on body condition of the horse, quality of hay, and activity level. A 14% protein, 6% fat, 12.5% fiber pelleted horse feed. Formulated with the performance horse in mind and can be fed at all life stages. Feed at a rate of 5 to 10 pounds per day, depending on body condition of the horse, quality of hay, and activity level. A 14% protein, 6% fat, 18.5% fiber pelleted horse feed. An alfalfa meal-based pellet formulated with the senior horse in mind, but can be feed during other stages of life. Feed at a rate of 10 to 20 pounds per day, depending on body condition of the horse and amount of dry hay consumption. A 12% protein, 3% fat, 6% fiber sweet feed, great for the companion horse or the easy keeping performance horse. Can be fed to horses at all stages of life. Feed at a rate of 5 to 10 pounds per day, depending on body condition of the horse, quality of hay, and activity level. A 12% protein, 3% fat, 6% fiber pelleted feed, great for the companion horse or the easy keeping performance horse. Can be fed to horses at all stages of life. Feed at a rate of 5 to 10 pounds per day, depending on body condition of the horse, quality of hay, and activity level. Stablelyx® Equine Supplement is a unique, palatable, high energy supplement designed for consistent free choice consumption by all classes of equine. Stablelyx ensures daily intake of trace minerals and vitamins necessary for top performance. Rolyx® Pro-Mag is a dual-purpose, low-moisture block, formulated with added protein and magnesium. It is designed to be fed free-choice to horses consuming moderate to good quality forages, fescue forages, low magnesium forages, or forages with high potassium concentrations that interfere with magnesium absorption. It is energy dense and highly fortified with trace minerals and vitamins. It also contains RABON®, the proven effective oral larvicide’s, to prevent the development of horn flies, face flies, house flies and stable flies in the manure of treated animals. Dried beet pulp, soybean hulls, wheat midds, ground roasted soybeans, soybean oil, soybeans, soybean meal, calcium carbonate, monocalcium phosphate, dicalcium phosphate, montmorillonite clay, diatomaceous earth, processed grain by-products, zinc sulfate, manganous oxide, copper sulfate, vitamin E supplement, vitamin D supplement, vitamin A supplement, sunflower oil, sodium selenite, beet molasses, ethylenediamine dihydriodide, cobalt carbonate, sodium carboxymethyl-cellulose, corn distillers dried grains with solubles, calcium carbonate., salt, L-lysine, magnesium oxide, DL-methionine, saccharomyces cerevisiae yeast culture, dried enterococcus faecium fermentation product, dried lactobacillus acidophilus fermentation product, dried aspergillus niger fermentation extract, dried trichoderma longibrachiatum fermentation extract, dried bacillus subtilis fermentation extract, dextrose, sucrose, calcium silicate, artificial flavor ingredients, propylene glycol, dl-alpha-tocopherly acetate, silicon dioxide, vitamin A acetate, mineral oil, biotin. Feed at a rate of 5 to 10 pounds per day, depending on body condition of the horse, quality of hay, and activity level. Provide free choice salt. Provide clean fresh water at all times. Wheat midds, ground corn, soybean hulls, alfalfa meal, ground roasted soybeans, soybean meal, soybean oil, calcium carbonate, processed grain by-products, zinc sulfate, manganous oxide, copper sulfate, vitamin E supplement, vitamin D supplement, vitamin A supplement, sunflower oil, sodium selenite, ethylenediamine dihydriodide, cobalt carbonate, sodium carboxymethyl-cellulose, corn distillers dried grains with solubles, calcium carbonate., liquid molasses, montmorillonite clay, diatomaceous earth, monocalcium phosphate, dicalcium phosphate, salt, magnesium oxide, L-lysine, saccharomyces cerevisiae yeast culture, dried enterococcus faecium fermentation product, dried lactobacillus acidophilus fermentation product, dried aspergillus niger fermentation extract, dried trichoderma longibrachiatum fermentation extract, dried bacillus subtilis fermentation extract, calcium propionate, dextrose, sucrose, calcium silicate, artificial flavor ingredients, propylene glycol, biotin. Alfalfa meal, wheat midds, dried beet pulp, beet molasses, soybean hulls, ground roasted soybeans, soybean oil, liquid molasses, processed grain by-products, zinc sulfate, manganous oxide, copper sulfate, vitamin E supplement, vitamin D supplement, vitamin A supplement, sunflower oil, sodium selenite, ethylenediamine dihydriodide, cobalt carbonate, sodium carboxymethyl-cellulose, corn distillers dried grains with solubles, calcium carbonate., calcium carbonate, monocalcium phosphate, dicalcium phosphate, L-lysine, magnesium oxide, DL-methionine, saccharomyces cerevisiae yeast culture, dried enterococcus faecium fermentation product, dried lactobacillus acidophilus fermentation product, dried aspergillus niger fermentation extract, dried trichoderma longibrachiatum fermentation extract, dried bacillus subtilis fermentation extract, calcium propionate, dextrose, sucrose, calcium silicate, artificial flavor ingredients, propylene glycol, vitamin A acetate, mineral oil, biotin. Feed at a rate of 10 to 20 pounds per day, depending on body condition of the horse and dry hay consumption. Provide free choice salt. Provide clean fresh water at all times. Coarse ground corn, whole oats, plant protein products, processed grain by-products, roughage products, molasses products, calcium carbonate, montmorillonite clay, diatomaceous earth, dextrose, sucrose, calcium silicate, propylene glycol , artificial flavor ingredients, zinc sulfate, manganous oxide, copper sulfate, vitamin E supplement, vitamin D supplement, vitamin A supplement, sunflower oil, sodium selenite, ethylenediamine dihydriodide, cobalt carbonate, sodium carboxymethyl-cellulose, corn distillers dried grains with solubles, calcium carbonate., soybean oil, saccharomyces cerevisiae yeast culture, dried enterococcus faecium fermentation product, dried lactobacillus acidophilus fermentation product, dried aspergillus niger fermentation extract, dried trichoderma longibrachiatum fermentation extract, dried bacillus subtilis fermentation extract, calcium propionate. Ground corn, wheat midds, dried beet pulp, soybean meal, calcium carbonate, molasses products, processed grain by-products, zinc sulfate, manganous oxide, copper sulfate, vitamin E supplement, vitamin D supplement, vitamin A supplement, sunflower oil, sodium selenite, ethylenediamine dihydriodide, cobalt carbonate, sodium carboxymethyl-cellulose, corn distillers dried grains with solubles, saccharomyces cerevisiae yeast culture, dried enterococcus faecium fermentation product, dried lactobacillus acidophilus fermentation product, dried aspergillus niger fermentation extract, dried trichoderma longibrachiatum fermentation extract, dried bacillus subtilis fermentation extract, calcium propionate, dextrose, sucrose, calcium silicate, artificial flavor ingredients, propylene glycol.